Electronic health records, or EHRs, are becoming the standard method of record keeping by medical professionals. According to the CDC, nearly 87 percent of office-based physicians use an EHR system. Given EHRs are becoming the rule rather than the exception, we surveyed more than 1,000 patients with access to EHRs and over 100 medical professionals who use the system about their opinions on this growing trend in the health care industry. Continue reading to see what we learned. When it came to the sentiment of medical professionals regarding the use of EHRs, responses were overwhelmingly positive. This was especially true for how EHR systems affected the workplace. The primary function of a medical care provider is to provide service and care to patients, and 86 percent of medical professionals felt an EHR system made that job easier. Another vital aspect of patient care is the ability to share patient data with other health care providers and organizations – 85 percent of those surveyed believed EHRs helped them communicate with more ease. These positive feelings can probably be attributed to technology and the efficiency of electronic records over keeping paper files. EHRs allow information to be accessed almost immediately. As with other technology, communication may be affected but the overall sentiment of our survey respondents regarding the use of EHR systems was still positive. The majority of respondents — 63 percent — believed EHRs made direct communication with patients easier, while 28 percent felt they did not affect it. Only nine percent said the technology hindered it. After segmenting medical professionals surveyed by occupation, we found administrative staff, medical laboratory scientists, and specialist medical practitioners had the most positive sentiment toward EHRs. Clerical staff had a 75 percent approval rate of EHR systems, and 71 percent of physician assistants also saw the system in a positive light. When broken down by facility type, those working in a group practice had a full approval rating (100 percent) of EHRs, followed by hospital staff at 92 percent and those working in private practice at 86 percent. A smaller, although modest, percentage (71 percent) of participants working at a clinic, urgent care or ambulatory surgery center viewed the use of EHRs as a positive practice. When analyzed by respondent age, the highest overall positive feelings toward EHRs were attributed to those aged 40 to 49 (92 percent). People aged 50 and older approved the use of EHRs 89 percent of the time, while 88 percent of those aged 20 to 29 and 87 percent of those aged 30 to 39 felt the same. 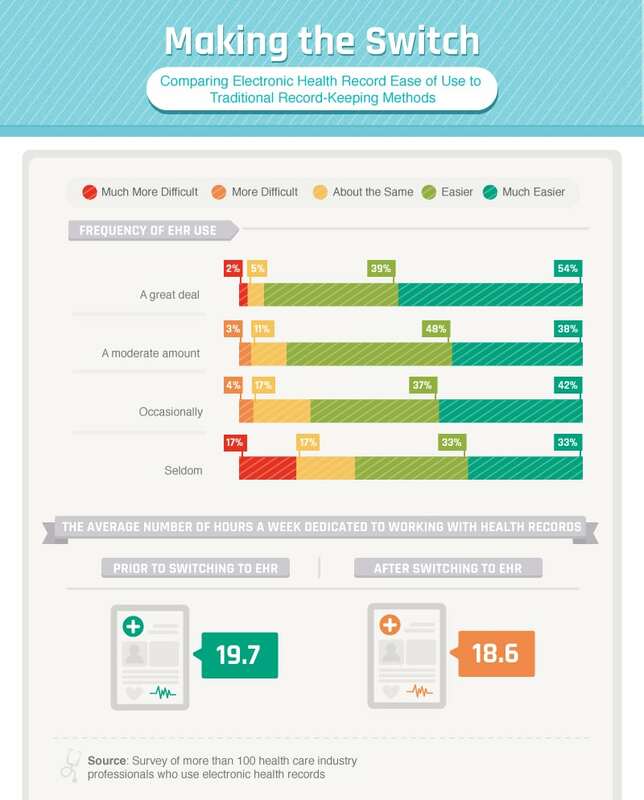 Our survey also compared the ease of use of EHRs to traditional methods of record keeping. Those who frequently used the EHR system were more likely to see its benefits than those who seldom used the system. For those who used an EHR system “a great deal,” 93 percent felt it was easier to use than traditional record-keeping methods. Of respondents who used the system moderately, 86 percent found the use of EHRs easier as well. Additionally, for the medical professionals who switched to an EHR system, the number of hours per week dedicated to working with health records decreased from 19.7 to 18.6 hours. 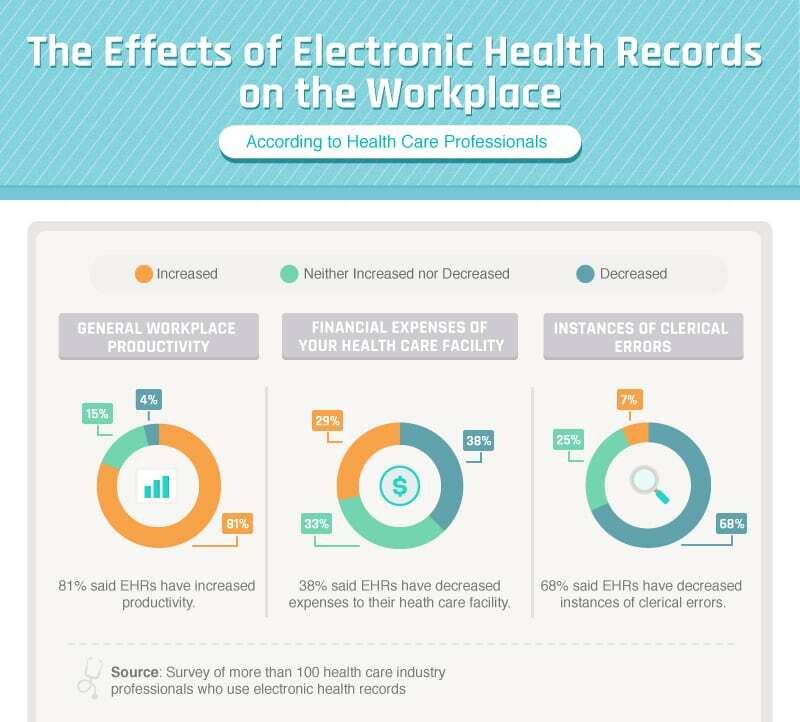 Healthcare professionals were also asked how the use of EHRs affected the workplace, including overall productivity, facility expenses and cases of clerical errors. Regarding general workplace productivity, 81 percent felt EHRs increased productivity, compared to only 4 percent who felt productivity decreased. When crunching the numbers, though, respondents were divided: 38 percent said EHRs reduced the expenses of their health care facility, 34 percent said costs neither increased nor decreased, and 29 percent believed the use of EHRs increased expenses. Finally, 68 percent of those surveyed felt clerical errors decreased when EHRs were used, as opposed to the 25 percent who saw no change in errors and 7 percent who felt errors increased due to the utilization of an EHR system. 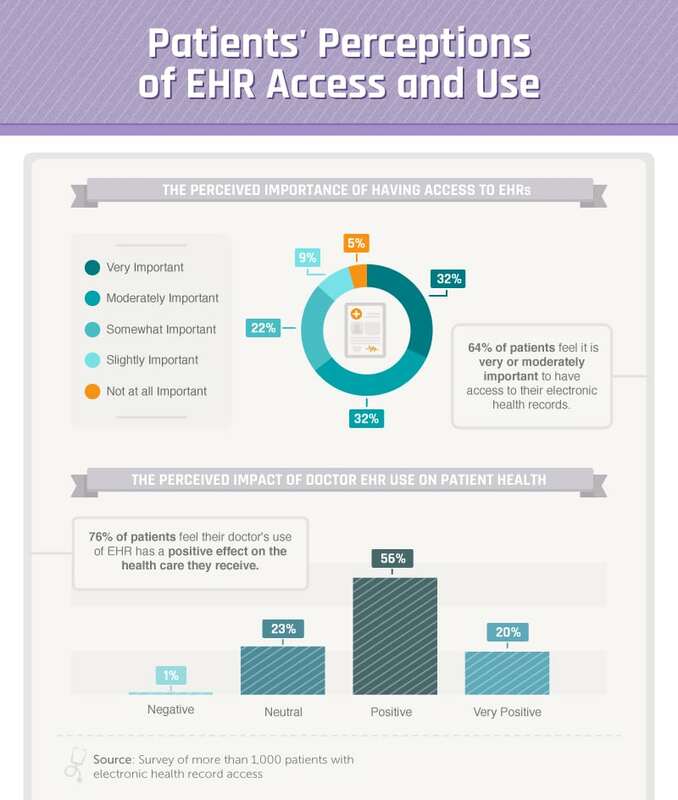 Overall, American patients with access to EHRs felt strongly that it was important. Of those surveyed, 64 percent of patients felt it was very important or moderately important to have access to electronic health records, compared to the 5 percent who thought it was not at all important. Moreover, patients’ perceptions of their doctors’ use of EHRs was very positive, with 76 percent of patients believing the utilization of an EHR system had a positive effect on the health care they received. Access to your health information is a vital part of being an advocate for your healthcare. Gone are the days when information was locked away in the doctor’s office and difficult to obtain. According to the National Partnership for Women and Families, 80 percent of Americans who have online access to the information in their EHRs use it. 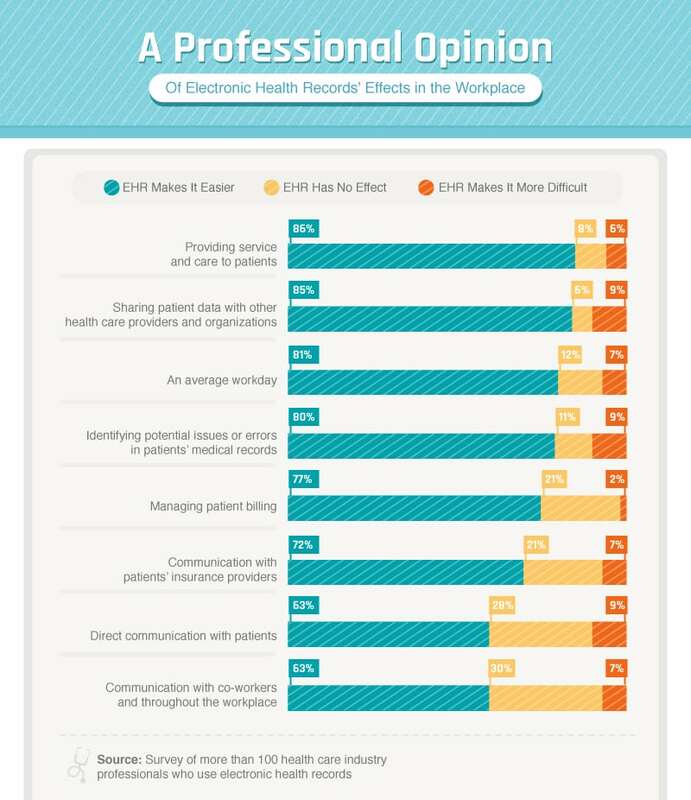 According to our survey, medical providers did an overall good job at explaining how patients could access their EHRs. Of the patients studied, nearly 59 percent felt their medical provider adequately explained how to access their records. However, this still left some room for improvement, as over 28 percent of patients felt their medical provider explained the process poorly or very poorly, and almost 13 percent were not given any explanation at all on how to access their records. Those who felt their provider explained the EHR system very well accessed their records an average of 8.5 times a year. For those who felt it was explained well, they accessed their EHRs 5.1 times annually. Conversely, patients who felt accessing their EHRs was explained very poorly only accessed their records 2.5 times in a given year. 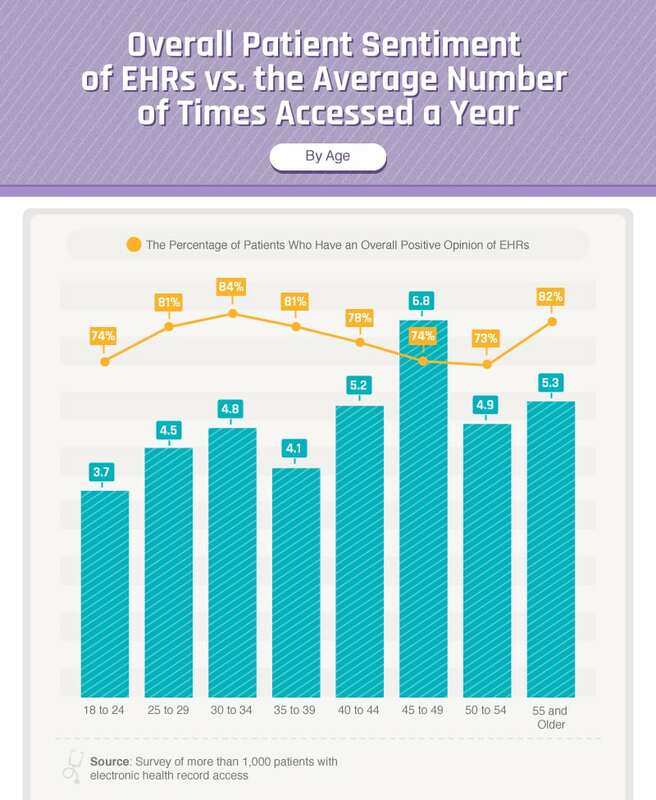 When comparing overall patient sentiment with the number of times they accessed their EHRs, positive sentiment toward EHRs peaked for respondents aged 30 to 34 (84 percent), but EHRs were accessed more frequently for those aged 45 to 49 – 6.8 times a year. While overall positive sentiment peaked for an age group that has grown up with technology, the frequency in which patients aged 30 to 34 accessed their EHRs may seem unusual. However, a possible reason for this difference could be medically related. Those aged 40 to 49 are more likely to be caring for aging parents who may be uncomfortable with using the technology themselves. When asked about which healthcare facilities granted them the greatest EHR access, participants identified hospitals at 48 percent, while 45 percent were given noteworthy access by a private practice, and 31 percent received EHRs both from a group practice and clinic, urgent care, or ambulatory surgery center. Less common responses were the pharmacy or drugstore, medical laboratories, and research facilities at 13 percent each, in addition to medical nursing homes or hospice facilities at 1 percent. When comparing survey responses from healthcare professionals and patients, both groups showed a strong positive sentiment toward EHRs. Patients had a slightly lower overall positive sentiment at 80.1 percent (positive and very positive) compared to healthcare professionals’ over 87 percent approval of EHRs (positive and very positive). Both patients and health care professionals viewed the use of EHRs positively. Additionally, the use of EHRs by patients greatly increased when the provider gave clear instructions on how to access and utilize private medical records. Overall, medical providers felt they provided better care for their patients because of EHRs, and patients felt they were given better care as well. This research shows the adoption of EHR technology is likely to increase as more medical providers adopt EHR systems and give patients access to their EHRs. At SelectHub, we recognize that purchasing software is a big decision, and we’re here to help.  We offer a streamlined solution for evaluating your EHR software needs. We surveyed 1,007 Americans with access to electronic health records and 107 medical professionals on questions related to their perceptions and experiences using EHRs. Of the 1,007 Americans with access to an EHR, 54 percent were male, 46 percent were female, and less than 1 percent identified as a gender not listed by our survey. Of medical professionals, 69 percent identified as female, and 31 percent identified as male. The average age of Americans with access to an EHR was 34, and the average age of medical professionals was 36. We love technology, and we’d love to see the results of our study on EHRs featured on your site for any noncommercial use. We only ask that you ensure a link back to this page so our contributors earn credit for their work. Get our in-depth EHR Software Comparison Matrix.